My boyfriend‘s little sister got married right before the new year. The wedding was a traditional modern Chinese wedding, at least according to my knowledge many Chinese weddings these days follow the same steps and therefore her big day is a great example of a Chinese wedding. First thing in the morning was to start with hair and make-up. While the bride was enjoying a facial mask, her mother, me and the bridesmaids got our make-up ready and hair done. It took a good few hours before she was able to start hers, change to her wedding gown and do final touches to her hair. Relatives started arriving during noon and they have lunch in a restaurant, when the rest of us ate from take away boxes. Everyone was waiting for the groom to arrive early afternoon. A lot of photos were taken from each of the bridesmaid and especially of the beautiful bride! Few of the “diamonds” on her dress fall out while dressing up, but luckily it didn’t show in photos. The dress was huge and filled the whole bed when she was waiting for her man to arrive. In China the groom arrived with his bestmans firing fireworks along the way. Then he has to pass several games or questions in order to open the door to the bedroom. For example he had to sing romantic love songs and slip money envelopes under the door. Finally the bridesmaids were satisfied and opened the locked door for the groom. 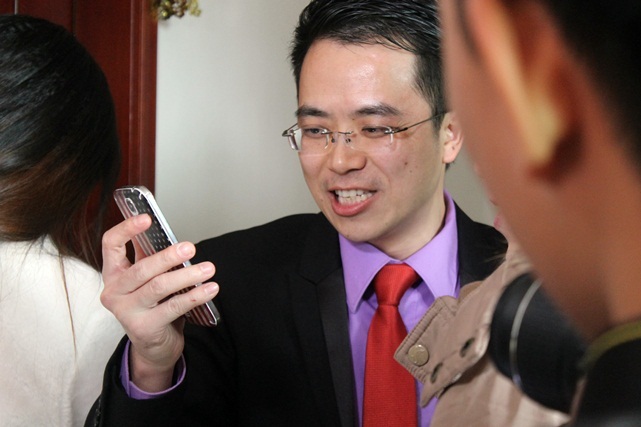 He gave the flowers to his bride and countless cameras and mobile phones started taking photos of the happy couple. The groom had also paid for a professional photographer as well as a cameraman. Next in order was the traditional tea ceremony where the new couple offered tea to the elders, starting from the bride’s parents. The mother of the bride also gave her daughter several pieces of golden jewelry. On a happy day like wedding family photos are of course necessary! Here with the couple are the bride’s parents, uncle, his wife and their daughter, and my boyfriend with me. It was a big thing for me to be included in all of the family photos, a feeling of acceptance to the family. Then the couple left the home village with a long black limousine! The bride truly looked like a princess when stepping into her majestic vehicle. 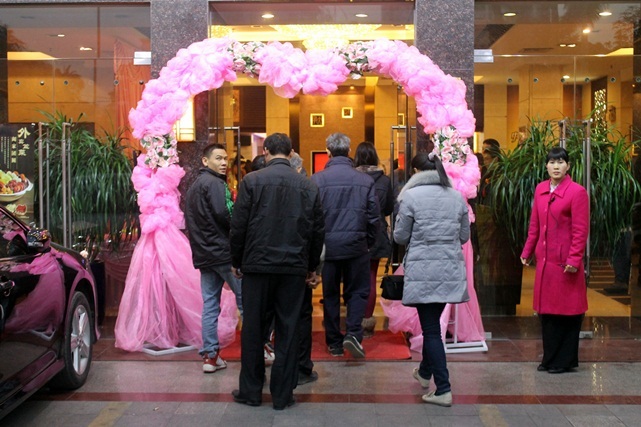 The wedding receptions was held in a famous restaurant not far from the couple’s new home. Near the entrance, the bride and groom were welcoming the guests with the bridesmaids and bestmans. 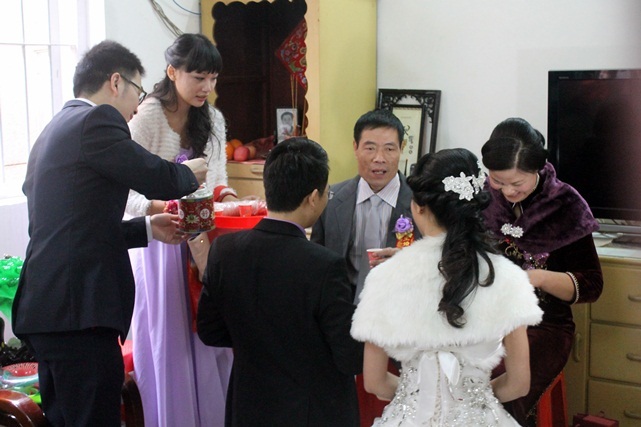 The bride’s mother was on the left collecting red envelopes full of money that is a traditional gift in weddings. Finally all the guests were seated and the new couple made their entrance. I almost started laughing when I heard the theme song from the Pirates of the Caribbean! Luckily it quickly changed to the traditional wedding tune while they walked past the guest to the stage. Both the groom and the bride said a few words to the guests, but there was no speeches from the parents. A ceremonial cut of the wedding cake was performed in the stage, but the cake wasn’t for eating. During the dinner the bride changed to her Chinese outfit and alcohol and tea serving started. The groom would cheer with others on hard alcohol, but the bride offered guests tea instead. Bestmans followed the groom and the bridesmaids followed the bride. In the end more photos were taken and the whole wedding ended around eight o’clock. 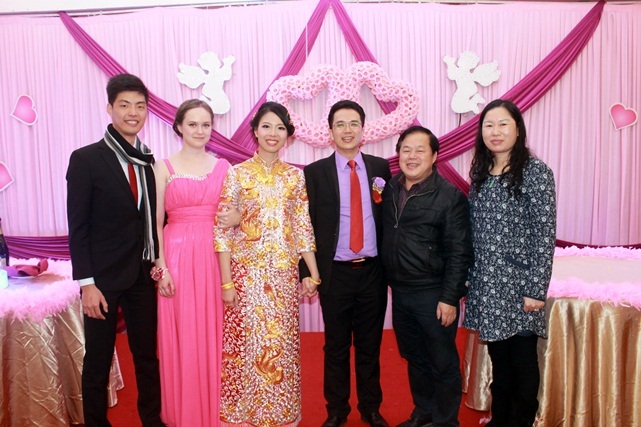 For a Finnish wedding it would be way too early (we like to party until late at night on our wedding day), but for a Chinese wedding it was completely normal. I am very happy for my sister-in-law and her husband, they make such a great couple! I felt huge amounts of happiness that day when I saw how happy everyone else was. I’m sure the wedding was pretty much everything the bride wanted for her special day. Me and Alan’s wedding will be completely different, but that’s another story for another blog post. Great story. Two questions: What is “tea alcohol” and how does your boyfriend have a sister given the one child policy? Jim, the one child policy is nowhere near as strict as people think. Also, it was first announced at the very end of the 1970s, but it took quite a lot of time to be fully implemented across the country, and evolved slowly into the policy that has just been modified over the last month. I don’t know the specifics of Sara’s in-laws’ situation, obviously, but I can think of several ways her fiance could have a perfectly legal sibling, for example, the fact she keeps referring to living in a village suggests that perhaps, as was the case in Beijing through the 1980s, Guangdong may have allowed rural couples two children. Sara, great post. It’s interesting the music people choose for their weddings, isn’t it? Pirates of the Caribbean is an odd one. The last wedding I was at featured both the Star Wars theme and a Wagner’s Ride of the Valkyries, neither of which I would want at a wedding, but the bride and groom were happy, so fair enough. Agreed. I know a fair few Chinese people who have siblings that were born in the 1980’s or later. Most of them are either from the countryside or have wealthy/well-connected families (so they just paid a fine for the additional child). Other people I know have siblings that are quite a bit younger or older than them; I think there was a rule that if one of the parents was an ethnic minority or both parents were only children, the couple could have two children but they had to be born at least 7 years apart. Don’t quote me on that, but I think it’s something along those lines. Let’s cut the bull. Everybody knows that millions of people cheated in the 1980’s and China’s real population is closer to 1.5 billion, not 1.3. And everybody knows that almost everyone who cheated was either a farmer, migrant worker, or some big whig cadre just like R Zhao suggested above. 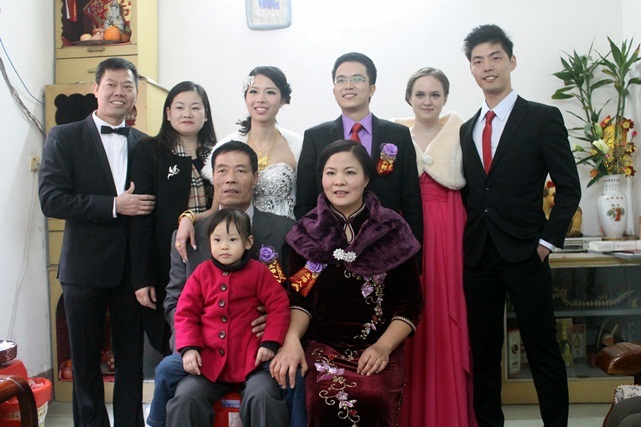 I meet young people in China all the time who have sisters and brothers. And, the truth is, their parents had a bunch of kids because they didn’t give a rip about the one-chld policy. But, while we’re cutting through the bull, if you’re college educated, live in a big city, and want a good job, you’ll be hard-pressed to have two or more kids unless you’re cool with paying a big fat fine and don’t care about colleagues who will discriminate against you because they’re jealous you have two or more kids or they genuinely support the one-child policy. Just ask Zhang Yimou. I think that’s a good point. I live in the city and most people I know who grew up here don’t have siblings. The fine is probably too high for most and the jealousy/discrimination issue might also be a factor. I also think people think of the cost of raising a child. Many Chinese people I know want to give their kid all the very best opportunities, like studying abroad, and I think they may feel that may not be realized if they have more than one child. We’re on the same page, R Zhao. I like calling a spade a spade. People can sugar-coat and cherry-pick all day long and it won’t change the truth. Paying fines (and how much you’ll pay) really depends on where you live. There are quite a few exceptions to the one child policy and if the parents are able to afford it, some will choose paying a fine in order to be able to have two or more kids. I have met people in their mid-twenties who had 5 siblings (all born after the introduction of the one-child policy and all brothers, so it also wasn’t the exception of being allowed to have more children if the first ones born were girls), but that was in Yunnan’s more remote areas. But having 3 kids is actually quite normal there. When I asked them if they had to pay a fine, they said no. 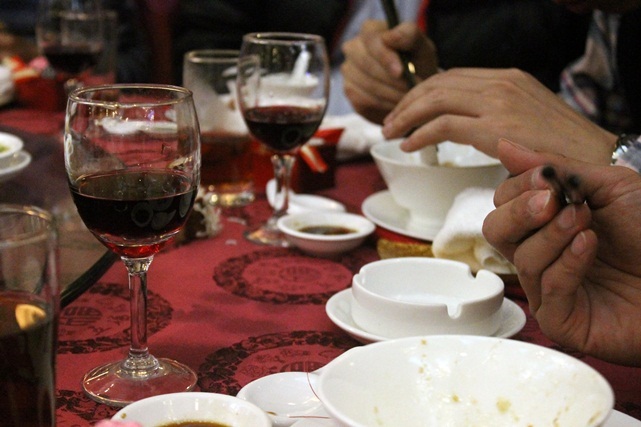 In some areas you supposedly can settle your debt with the local government with a nice dinner and some baijiu. I would assume that this is not as common in the bigger cities, but it’s not a rarity in smaller ones. I have also heard of children being given to their grandparents or some aunt, so it won’t be too obvious that the parents have more than just one kid. 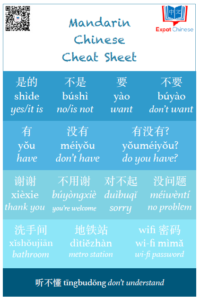 Another thing: In Chinese, people often refer to their cousins as brother or sister, so it’s sometimes confusing as to if they are talking about a brother/sister or a cousin. Good point on your last sentences! My boyfriend calls his cousin “little sister” all the time even though it should be 堂妹 to be exact. But the girl in these wedding photos is his real little sister. I was thinking the same, music is something so interesting in each wedding. In our wedding the girl in charge of the music had chosen Titanic and I’m telling you that was sad, talking with that music in the background was pretty sad. We also had Star Wars. Which I think was pretty cool. I’m so going to be in charge of the music in our wedding! Well, we plan to organize it our selves anyway. We also organized the wedding by ourselves :) even though it was not in Shanghai we went there twice the months before the wedding to organize all…but for the music the girl next to the machine who was in charge of the volume, decided to add her own music. You just need to go with the flow. My husband has a sister and that sister has two kids. His brother in law has 3 brothers..and so on. They were born as “black babies(black market)”, registered later on in a different hospital. Their parents paid for them but not so much for being in a very rural area and due to some dinners and networking. If the income and taxes are not so high you wont be asked to pay much for your second child either. My baby nephew is 1 year old and they didnt register him till one month ago. Just an example. But also, for my husband it has been a nightmare to get all the documentation for the marriage license. Almost everyone I know here has a sibling. Hi Jim, the first one was a mistake and I changed that now. It should be alcohol and tea. The second one had good conversation below already. I actually know other families with more than one child as well. Interesting! This is a bit different from weddings I’ve been to in Hebei. I’ve never participated in the pre-wedding activities, just gone to the ceremony and meal. The weddings I’ve attended have always been held at lunch time and generally wrap up around 2pm. 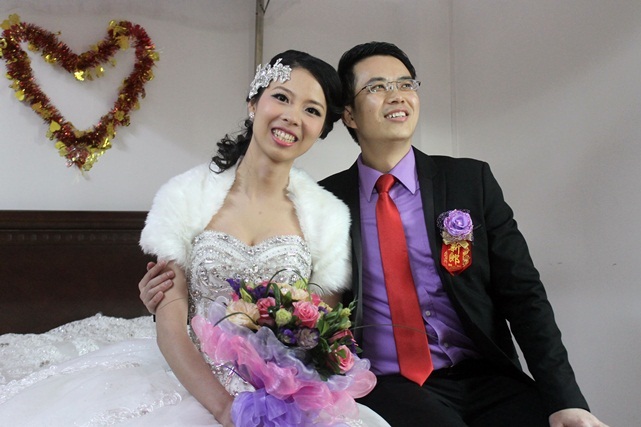 Since weddings are often on weekdays (is it the same in Guangdong? ), many guests return to work afterwards, which is strange to me as most of the men are drunk! In the U.S., my home country, weddings tend to end late, probably around midnight. In my hometown, people almost always get married on a Saturday. Which part of Hebei? Here in Beijing weddings tend to be on weekends, though not always. My wedding was on a Friday, and my brother in law’s wedding was on a Wednesday, but those were in Yanqing County in Beijing’s northwestern extremity – a county that was part of Hebei until 1958 and Chahar until that became Hebei’s northwestern region in 1952. Chengde. 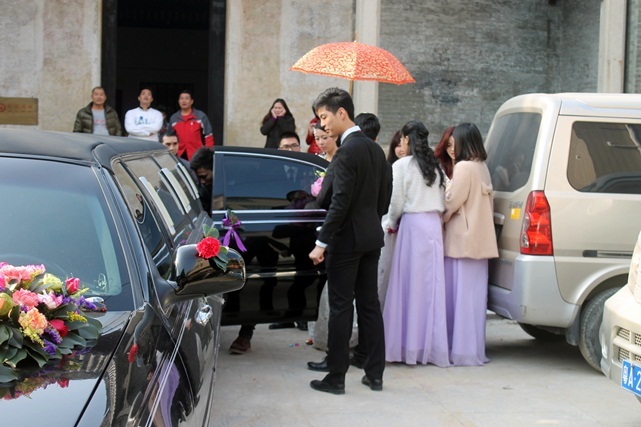 I have been to weddings on weekends, but generally they are held on whatever day the family believes is lucky due to the Chinese lunar calendar, which often falls on a weekday. In Beijing, do you also have the ceremony and meal at lunchtime? I asked a Chinese friend about this and she said in Beijing and parts of Hebei it is considered back luck to marry after twelve noon if it is a first time marriage for the couple. If one or both are divorced, it is appropriate to get married after noon. For those who have had multiple marriages, getting married in the late afternoon or evening is ok.
One other point, I have never attended a wedding with clearly appointed bridesmaids or groomsmen. I don’t think that trend had caught on where I live. Yes, all weddings I have attended here have been held at lunchtime, generally with the ceremony proper starting just before 11am. Nobody ever bothered to tell me why, and to be honest, I just assumed that was just the custom. All weddings I’ve attended here have had a clearly appointed bridesmaid and best man wearing a little rosette advertising their status. Hmmm, interesting. Maybe there have been bridesmaids and groomsmen (they just wear a rosette? no ugly, matching dresses?) and I didn’t notice. I never gave the time much thought either, but I think the superstition behind it is interesting! 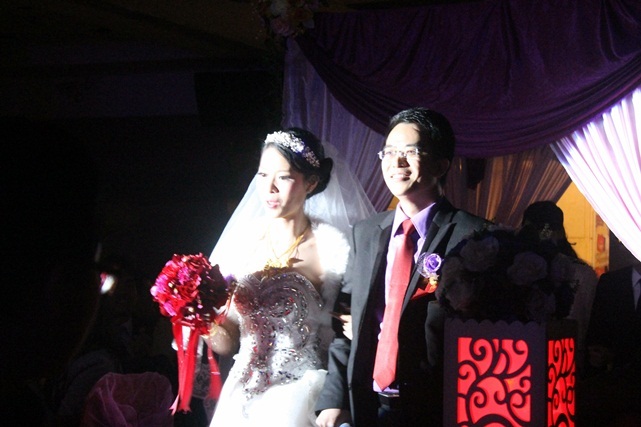 These two weddings I’ve participated, the wedding banquet was on dinner time. For the date it’s important to be on an auspicious date to bring good luck. In Finland we would party late into the night, I hope to do that on our own wedding as well. For a Finn it would be a lame wedding if everyone leaves before 10pm! If your kids get Chinese citizenship, the one-child policy will apply to you as well. So only one child with Chinese citizenship allowed (if you want to avoid having to pay fines). If your child has a foreign citizenship, the one child policy does not apply. Unfortunately China does not allow dual citizenship, not even until the child is 18 years of age, so you’ll have to choose either Chinese or foreign citizenship for your child. This is true. We are planning to have Finnish passport for the kid(s). We think it’s better for them in the long run and if we have more than one, they would have the same citizenship. I have been looking into a lot of this over the past year. I am pregnant with my first and we are having it in China (I am American and my husband is Chinese). My husband already has a child. The local police actually called the head office of the province (Hebei) and I was given the green light to “have one hundred babies.” I think it really depends where you live and what officials you are dealing with. BTW, we had to get a certificate granting us “permission” to conceive a child (good up to two years from date of issue). Ha! I have also been told different information, by the local police and by the U.S. embassy, about how to obtain U.S. citizenship for the baby. The local police told us they flat out would not recognize our child’s U.S. passport, while the U.S. embassy said they must recognize it. It’s frustrating. Furthermore, if your child does have a foreign passport, s/he will need a visa to stay in China and will not be allowed free public education. At least, that’s what I’ve been told. Still trying to get to the bottom of all of it! That’s the problem – you get a lot of different information depending on where and who you ask. If your child is born in China, it will have a Chinese hukou, but you’ll need to give up Chinese citizenship (which it automatically gets with birth in China) when you get your child US citizenship. Last time I extended my visa in Shenzhen, we asked the officer about the rules if you’re having children. He said if your child has foreign citizenship, you can apply for a 2-year residence permit. If it’s born in China (I’m not sure if he was only referring to those with Chinese citizenship or to those born in China but who have attained foreign citizenship), you’ll need to get an exit-permission for your child in your husband’s hometown (where he has his hukou registered) every time you want to go abroad. I’m not sure about the rules when your child has a Chinese hukou and foreign citizenship. I know that your child can’t go to public school and won’t get social insurance (if your Chinese husband is working in China) if it was born aborad, it would be interesting to know how these things work if the child has foreign citizenship and a Chinese hukou. This seems to be a bit of a grey area, so maybe that’s where all the confusion’s coming from. I’ve heard that men can have as many kids as they want to, what they look at is the woman. Eg. if a guy has a kid from a former marriage, he will still be allowed to have another one in a new marriage if his new wife hasn’t had a child in the past (this applies if both people are Chinese). Your bf really resembles his father, and your little sister resembles her mother XD. That’s what everyone says! Luckily my bf doesn’t have such a strong chin like his dad though. Her bridesmaids were not married as long as I know. I can’t wait to share our wedding plans with all of you as well, it’s definitely going to be a mixture of both cultures and something me and my bf prefer ourselves. Oh I loved looking at those pictures so much! 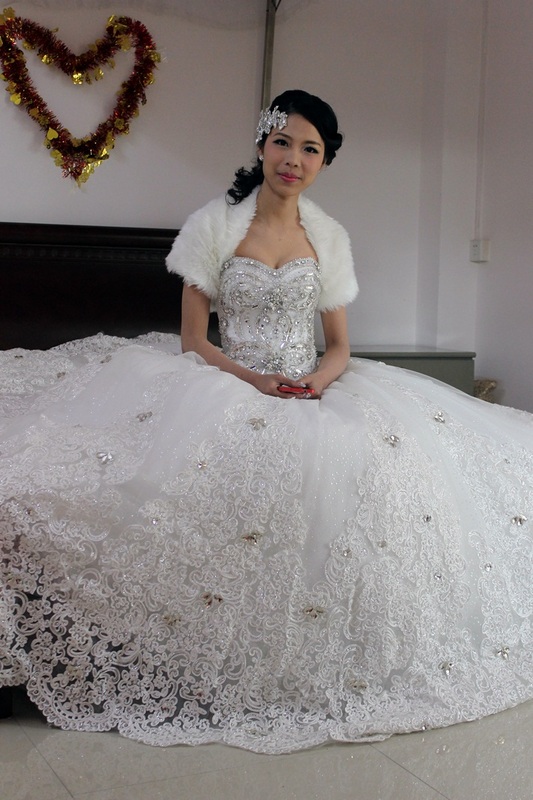 I have never been to such a “modern” and maybe more rich Chinese wedding, though I have been to many many weddings in the villages. But they are so different from what you discriped… Even my wedding in China was totally different, and not what I had wished for. But I accepted the things as they are as it made my parents-in-law very happy. I will have another wedding in Germany one day :) And it will be exactly as I always dreamt it would be. The parents don’t want to spend even one yuan on something they don’t actually need. They rather live simple lives and spend big on days like weddings. In our case it might be hard to make the parents happy, it’s just totally different from what we want. For example our wedding day isn’t exactly a lucky day, but that’s the time when my family can come to China, so then it’s a very good day for us. I was surprised and relieved of the duration of our wedding. That was a huge relief because we had plenty of traditions the days before, the same day, and even the day after. Our wedding finished at 3.30pm and then we continued till the night in different groups. I’m just telling you, we were exhausted before the ceremony even started! The day before we woke up at 4am and T started delivering in person the invitations to 130 people. Days before we took some pictures, we went to the decoration company..etc…The wedding day we were so tired that we were looking forward to the end..we just wanted to sleep! But wait! cause at 4pm we went to my in laws so that everyone could see us again, then we went for dinner with the guy who gave the speech and in the night..KTV with Ts close friends. I think instead of singing I was dreaming! The day after the ceremony Ts mom called to say we didnt finish yet! WHAT? yeah we forgot ghost money! Oh my, sounds exhausting! I’ve come to understand that in case of our wedding, it’s impossible to please everyone. I’ve heard many Foreign-Chinese couples say that the wedding wasn’t really something they wanted themselves, I hope I do t have to join that club. hi,i am happy to find your blog occasionally.i love a man from austria,and u love a man from china,but it seems u2 more easy to have happy ending.i work for the goverment,he is busy always in another city……..so everything comes not easy.i envy u2. I wish all the best to you and your Austrian man. Multicultural relationships aren’t always easy, but it can also be very worth it. Cute photos. Do white girls only like asian guys if they’re tall? I’m a short asian guy but I’ve been told I have a nice looking face and I’m nice to everyone.